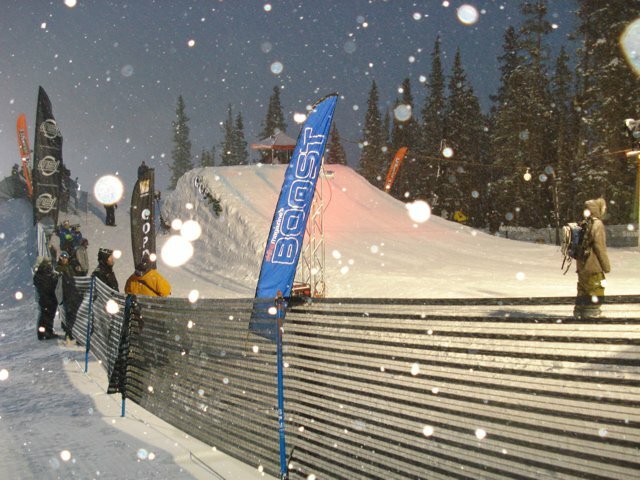 It was a chilly night tonight at Copper Mountain, Colorado for the most prestigious part of the US Open, the renowned and well-loved big air contest. 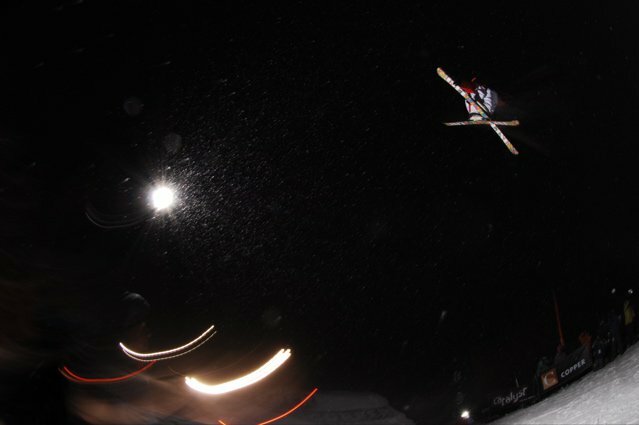 As a large crowd of weekend warriors and freeskiing fans gathered at the base, 33 of the top skiers going took to the sky to throw their biggest and best under the lights. 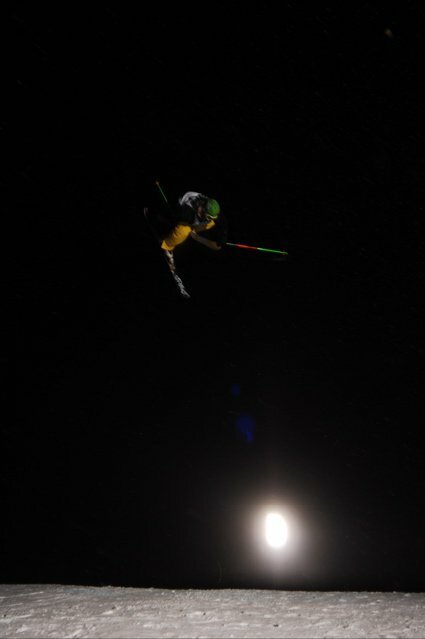 The jump itself seemed to be smaller than in years' past, a factor that had some of the athletes complaining during practice and wasn't helped by the snow pounding down on the in-run, slowing things down for the first half of the event. 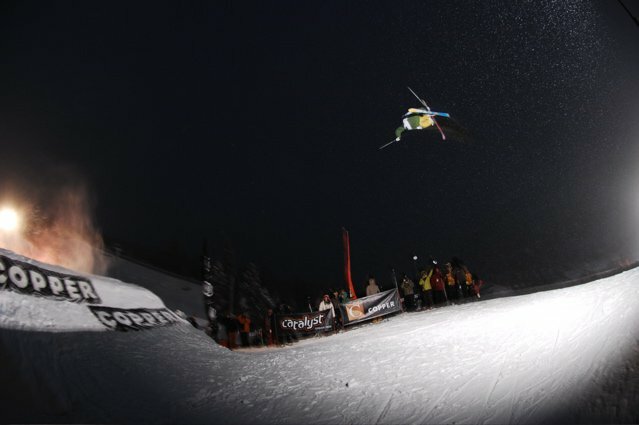 Before the actual comp got going, the fans were treated to the Flying Circus, where a quiver of skiers not in the comp sent it hard off the jump one after another rapid-fire style. 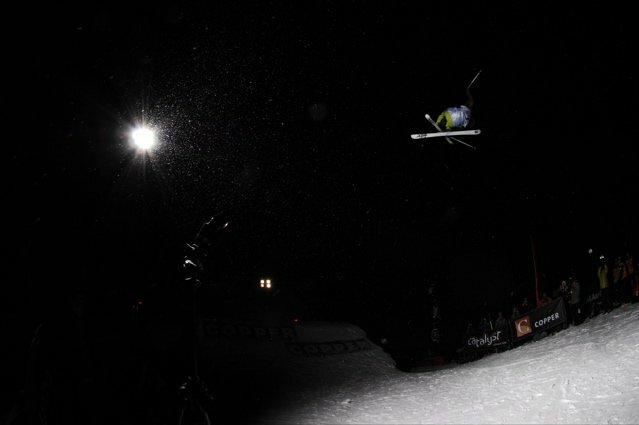 The crowd-friendly display continued throughout the event in between runs all the way till the finals. 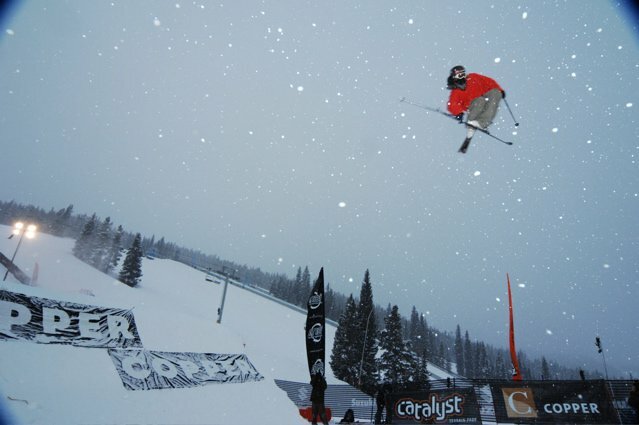 Jacob WesterSemi-finals kicked off with a bang as unknown Bobby Brown, who's been skiing extremely well all week, threw down a kangaroo flip off the jump that many considered to be too small to double. 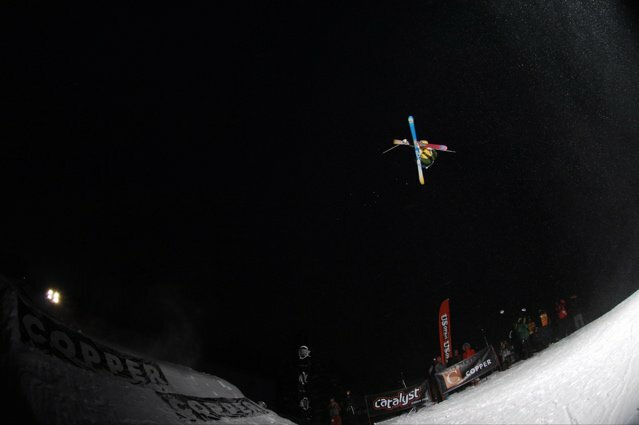 Jacob Wester answered with a kangaroo of his own and Andreas Hatveit and Charles Gagnier both threw down huge switch 10's that set the bar for the rest of the field. The switch 10 trend continued all through semis and eventually into finals, and Sammy Carlson threw the biggest one of them all in semis to take the top spot going into finals. 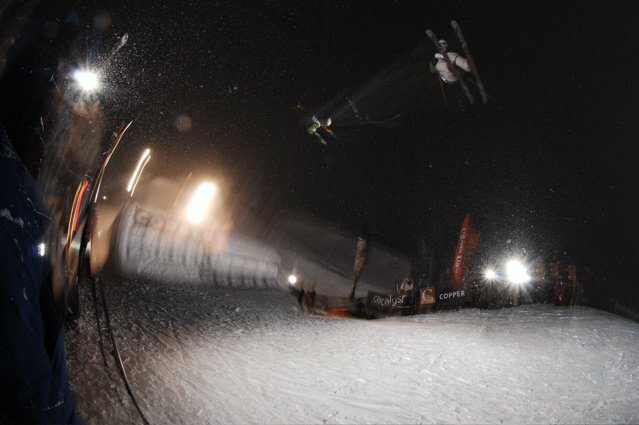 Also on point throughout semis was...well pretty much everyone, as Mike Clarke, Jossi Wells, Colby West, Alexis Godbout and a host of others began taking their tricks way down the landing much to the delight of the crowd that was braving the cold without a word of complaint. 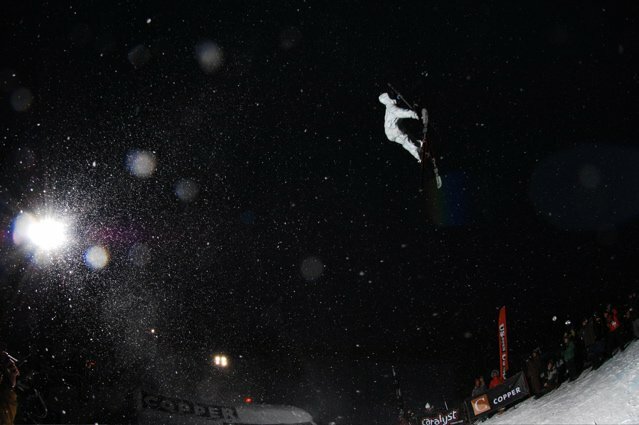 Once semis were all said and done, the field was narrowed down to the top eight of the night, including Andreas Hatveit, Colby West, Jossi Wells, Charles Gagnier, Sammy Carlson, Mike Clarke, Thomas Doplads and newcomer Russ Henshaw who was fresh off his silver medal in slopestyle yesterday. Sammy was paired off against Mike Clarke first, and after a stellar and stomped switch 9 from Clarke and a disappointing fall from Sammy, Clarke was sent to the next round. The loss didn't slow Sammy down though, as he continued to hit the jump all night strictly for his and the crowd's enjoyment. X-Games gold and silver medalists Andreas Hatveit and Jossi Wells went next, with Jossi throwing a huge switch 10 nose and Andreas coming in hot with the switch 12 that he won X with. He bobbled a bit on the landing though and Jossi's 10 was just too nice for words, sending everyone's favorite kiwi on to the next round. Next up was Russ Henshaw and Thomas Doplands. Henshaw continued to throw down and Doplands traveled too far right off the jump and crashed hard into the fence, giving Henshaw the win. Charles and Colby went last and while Charles threw a picture perfect switch right 9 octograb, it was not enough to beat out Colby's continued amplitude, which gave him the win. The final four then squared off with Colby taking on Russ and Jossi up against Clarke. Jossi and Colby continued to dominate the field, taking their switch 10's further and further down the landing each and every time. After they knocked off their opponents, it became evident to everyone in attendance that the two best friends were a force to be reckoned with and were well on their way to an exciting showdown in the finals. The finals were best two out of three and the consolation round (or as Luke Van Valin and Uncle E called it, the small finals) was one shot. 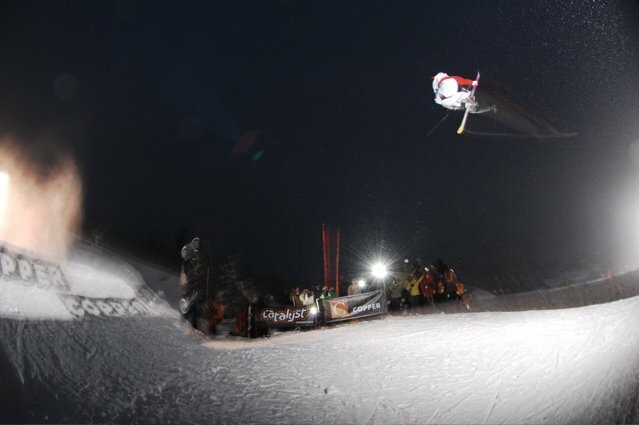 Colby dropped in first and continued to throw down bigger than before, and while Jossi returned the favor the first jump was awarded to Mr. West. Clarke than squared off against Henshaw, and threw a gorgeous switch and super corked out 9 that he stomped so hard it sounded like he landed on a tennis court. Third place went to Clarke and in a strange turn of events, Crenshaw asked him for a re-run so he could attempt win the bronze. Clarke politely declined. Smiles, hugs and secret handshakes were a plenty as best friends and all-around good guys Jossi and Colby headed back up top for their second run. This time Jossi took it a bit bigger than Colby, and after a few moments of silence and suspense while everyone awaited the results, the judges awarded the round to Jossi, setting up a third and final deciding jump. The energy and stoke level was super high amongst the crowd and fellow riders, but no more so than in Jossi and Colby themselves. Colby dropped in first with the hugest switch 10 of the night, and Jossi followed it with one of his own with a textbook and lengthy nose grab. In a true show of class, Jossi claimed Colby for the win, saying he went bigger while Colby claimed Jossi, saying his grab was better. 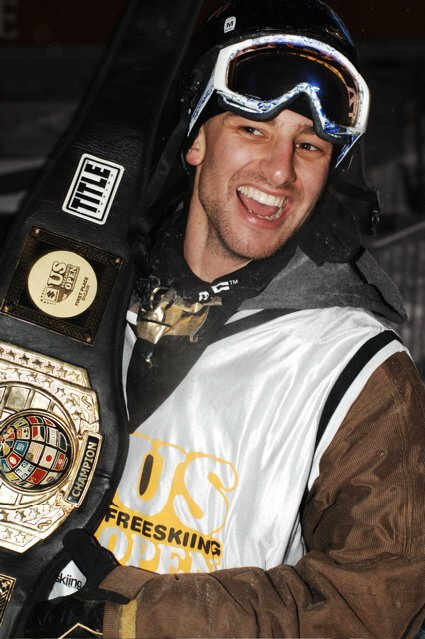 After some brief deliberation, Colby West took home his first and well-deserved gold at a major event. The boys made their way to podium side-by-side, and after Colby hoisted the heavyweight championship belt over his head with a smile brighter than the fireworks that were about to go off, another US Open big air was in the bag. Tomorrow the pipe finals go down, and be sure to keep yourself glued to NS between the hours of 12 and 4:30pm MST, as we'll be continuing our live broadcast of one of the biggest events of the year.